Travis Broton got his first deer tonight! Preheat oven to 350 degrees. 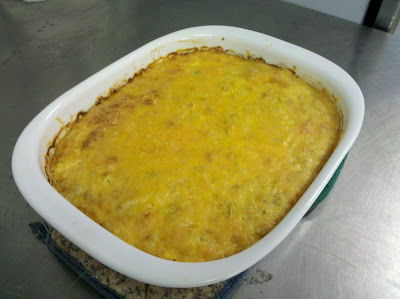 Grease a 9X13 casserole pan. Brown sausage until fully cooked. Combine all ingredients in a mixing bowl. Pour combined ingredients into bakeware. Sprinkle remaining cheese on top. Cook at 350degrees for one hour until heated throughout. 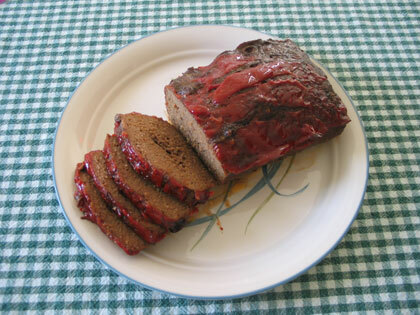 Try this recipe with any Cordray Brothers sausage from venison or pork. Brown the sausage meat until fully cooked. Combine together sausage, cheese, and can of tomatoes. Melt and mix in microwave until thoroughly mixed. You may keep it warm in a crock pot on low for a party mix. Can also be made with any Cordray Brothers sausage in venison or pork. If you enjoy extra spicy, Rotel offers a hot flavored tomato mix as well. Fresh, never frozen Cordray Farms Beef cuts are in the meat case! We've restocked the meat case in our on-farm store here at Cordray Farms. We have plenty of steaks of all varieties, burger, roasts, and even some juicy soup bones! All our beef is born and raised on our farm. They are pasture raised and never receive added hormones, antibiotics, medications or commercial feeds. We also have farm fresh eggs from our free range chickens. We're open 9 am to 10 pm Monday - Saturday. If you're lucky, you might just see a big gator while you're here as we are in the middle of deer season and the last full weekend of alligator hunting season! 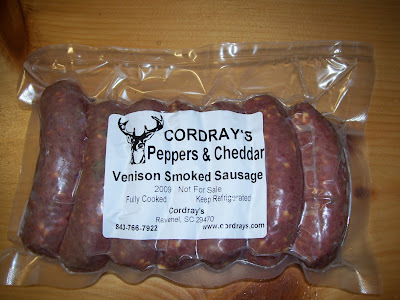 Have Cordray's make your venison into our best selling product, Peppers & Cheddar Smoked Sausage! STILL looking for that 14 footer! 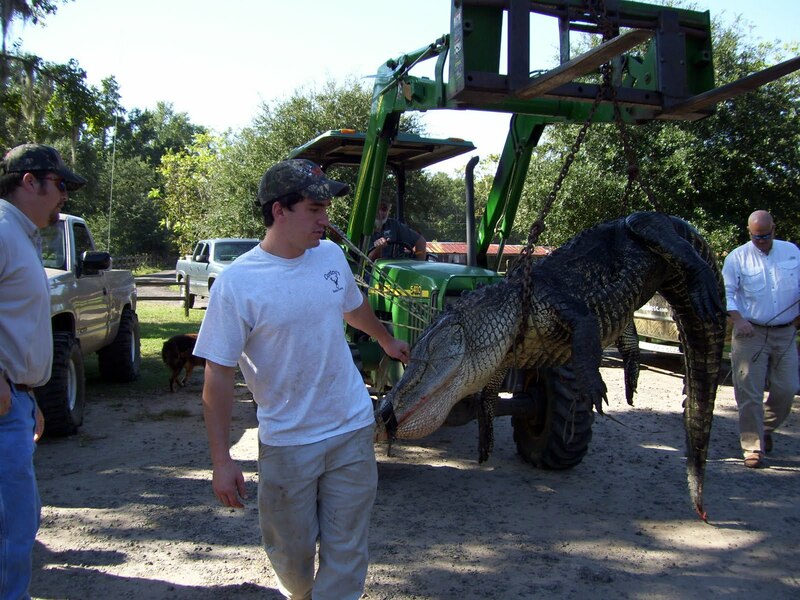 If you bring him in on this last full weekend of Alligator Season we'll mount the head for FREE! Chad Stewart and Shawn Conner got a triple! Morgan Cameron's buck weighed 182 lbs. and had a 20 inch spread. Lee Ecle got her first deer in 16 years! Ted Bishop got this 12ft. 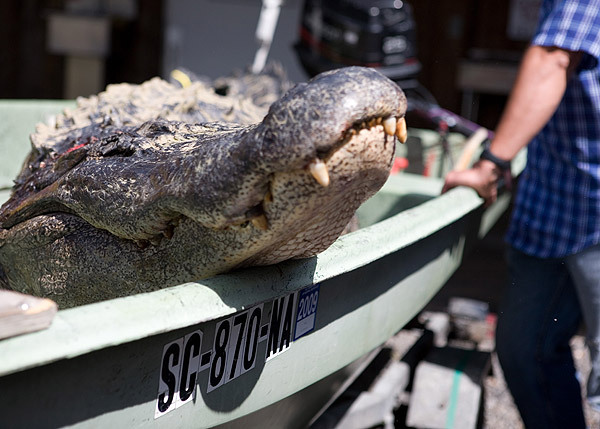 4 inch long alligator that weighed 562 lbs. 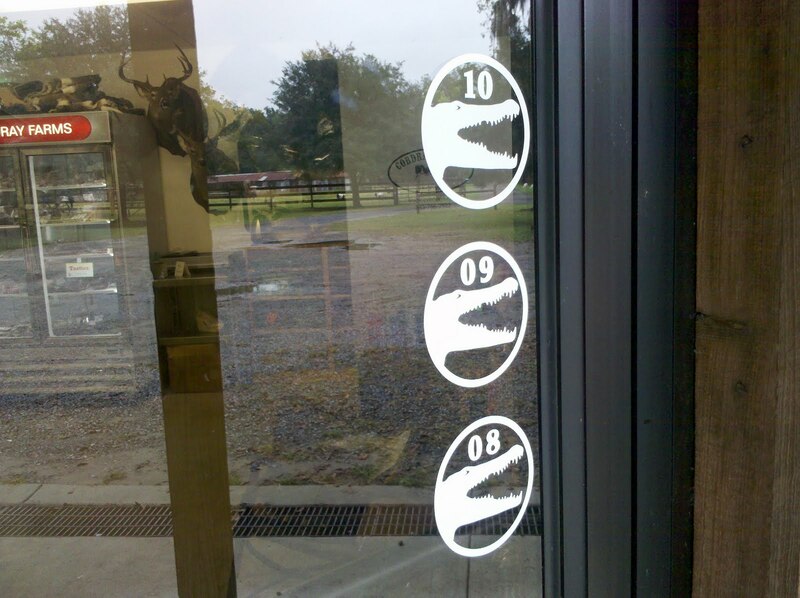 Thanks for the gator stickers. I am very pleased with my gator head & tanned hide that I picked up over the summer. 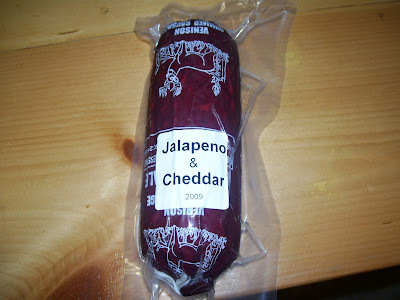 The meat was excellent, processing & packaging were all great. I hope to bring a few deer your way in Nov...I'll be hunting down your way. Look forward to seeing the updates on your website also. Cordray's venison meatloaf is ready to cook! Curiosity isn't good with alligators! More facts from our friends: If alligators catch small animals, they tip their head back and swallow them without chewing. They open their mouth to let spit evaporate and help them cool off. 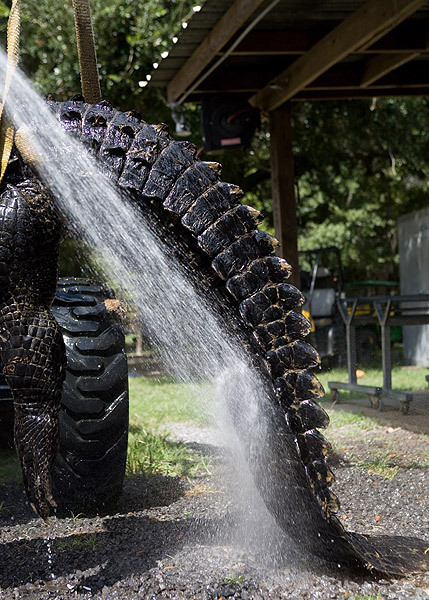 Some birds help clean an alligator or crocodile's teeth. They live to be about 60 years old. The mommies carry the babies in their mouth or on top of their heads. The mommies watch the babies for about 18 months. A recent big fat alligator we got had a huge big belly. We couldn't stand it. We had to know what was inside that thing. Kenneth open the stomach and ran! Out poured some VERY smelly, VERY huge fish! We won't be doing that again!!! 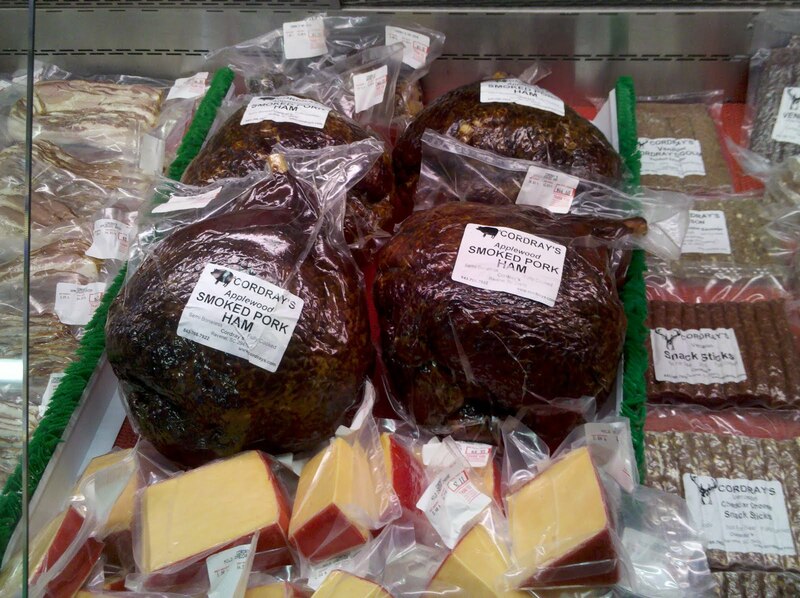 Applewood Smoked Hams - fully cooked and delicious - in the case now! 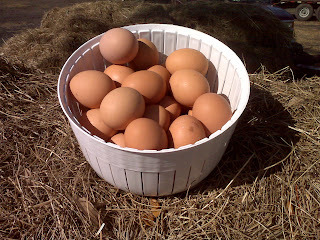 Farm fresh eggs from free range, happy hens! Timothy Zayac and Rob Rowe brought in this 10.5 ft. alligator! How do you tell the difference between an alligator and a crocodile? Alligators are sometimes mistaken for logs. They move fast to catch prey, but usually they are slow. They tuck their legs to their bodies when they are swimming. 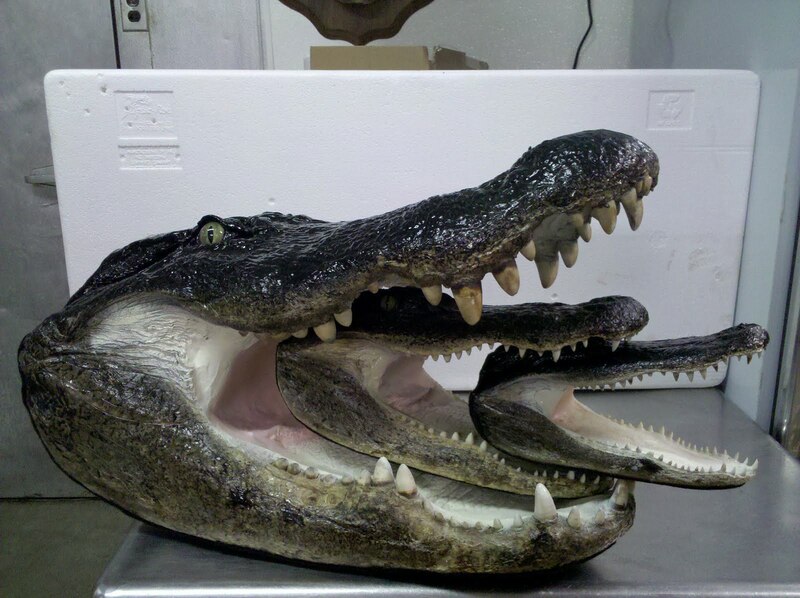 Alligators have a rounded nose and crocodiles have a sharp nose. They eat their babies if the babies are dead. They walk slow on ground. Their nest is a big mound. Brad Taylor of Taylor Outdoors got another big gator! 12.5 ft. and 416 lbs. Kenneth will make this big fellow into an awesome rug! Jayson Sellers got this buck in the morning! Chris Kuntz had another good day! How much meat comes from a 713 lb. alligator? How about 164 lbs. of packaged meat? 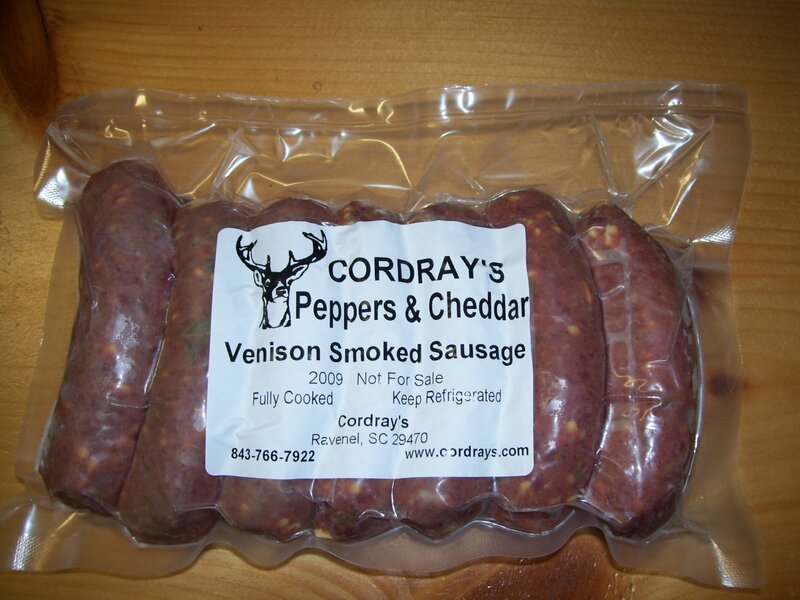 We're getting rave reviews from our Cordray Brothers alligator sausage and alligator cubed steaks. Stay tuned for recipes! Where's that 14 footer? FREE Head Mount if we process the BIG ONE! Matthew Key got a big buck that dressed out to 114.8 lbs! Carl Graack and another big buck! Jeremy Blizard got the complete Cordray's Hall of Fame Treatment! Blood on your ears, so you can hear the deer, on your nose so you can smell 'em, above your eyes so you can see the deer,by your lips so you can taste the deer, and all over, so you can feel the deer! Brenda Hoats got this big bucks a few weeks ago. Thanks for letting me know I missed posting it! Alligators see in black and white only, not in color. They have spikes on their backs. Crocodiles build their nests in a hole underground and alligators build in a mound on top of the ground. Alligators are related to dinosaurs. 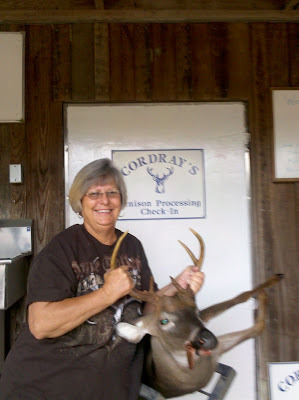 Lauren Tillman joined the Cordray's First Deer Hall of Fame! Nicole brought her first deer in to Cordray's and got the Royal Treatment!